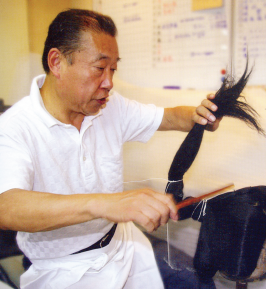 GARDENA — An exciting and informative lecture and demonstration featuring a Japanese wig stylist, Tokuo Toyotani, and his son and protégé, Kazuo Toyotani, is scheduled for Saturday, Aug. 6, from 2 to 4 p.m. at the Main Hall of the Gardena Valley Japanese Cultural Institute, 1964 W. 162nd St. in Gardena. During the event, titled “The Art of Tokoyama,” Toyotani, of the renowned Gekidanshinpa Theatrical Group in Japan, will discuss the art of combing Japanese dance wigs used in kabuki and classical dance. He has been invited to present this educational forum by the Nihon Buyo Kai of California, a nonprofit organization established by a group of Bando School students to promote and perpetuate the art of Japanese traditional and classical dance. Following the demonstration and lecture, a Japanese traditional dance will be performed by a Bando student wearing the wig. Admission is $5 per person, payable by cash or check and at the event. However, seating is limited and interested attendees are encouraged to reserve online at https://gvjci.wufoo.com/forms/the-art-of-tokoyama-the-japanese-traditional-danc/. You can also reserve seats by calling (310) 324-6611 or emailing [email protected] Children under 10 are free. For more information in Japanese, call (310) 800-0118. “The Art of Tokoyama” is co-sponsored by the Nihon Buyo Kai of California and the GVJCI.